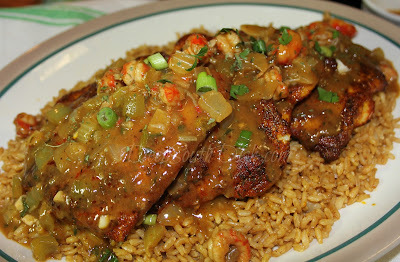 Catfish fillets, dredged in blackening seasonings and cooked in a hot cast iron skillet, served over Cajun Rice Pilaf and finished with an etouffee sauce with crawfish. Southerners have been blackening foods since Paul Prudhomme came up with this method many years ago. Heavy seasonings seared into a piece of protein is heaven on a plate, and most of us in the Deep South have eaten it in some form or another in our lives. It started with redfish, and seafood is most common here along the Gulf Coast of course, with catfish certainly taking a top spot on the list. These are the gorgeous filets I used this round. Aren't they so beautiful and fresh looking? The good folks at Eat Y'all, sent me some of these Delacata fillets to try and let me say this right off the bat. I have been eating catfish all of my life, but I swear before the good Lord as my witness, I have never had catfish like this. If you know anything about fish, you can see how pure these pieces are. Delacata is like the filet mignon of catfish y'all, and it comes from Simmons Catfish, but the taste is so fresh, you will swear you just fished them out of a pond yourself! Simmons catfish are grown in man-made ponds, right in the rich soil of the Mississippi Delta. The ponds are filled with filtered, fresh water that is pumped in from underground wells. It arrives at your home in an insulated container, and in an ice-glazed, flash-frozen state, each individually quick frozen (IQF), so that you can remove whatever you need from the bag and quickly defrost for last minute menu planning. Simmons carries a full line of catfish, but the Delacata catfish are center cut, premium catfish fillets that are deep skinned and hand trimmed, giving them a firm texture and meaty flake, similar to grouper, halibut and snapper, at a significantly lower cost. The flavor is mild and versatile making them perfect for a wide variety of recipes outside of the typical frying we often do with catfish, and there are plenty of recipes to try at the Simmons catfish website. Simmons catfish is currently available to consumers fresh from the catfish farm and right to your doorstep, where you can buy them whole, in strips, steaks, fillets, pre-marinated, breaded, as well as these beautiful prime cut, Delacata fillets. They are low in fat, high in Omega-3, and an excellent source of protein, as well as Vitamin B-12. From the site, shipments go out Tuesday, Wednesday and Thursday, via FedEx, and shipping cost is included in the website pricing. I decided to blacken my first round with the Delacata, so I headed outside with my trusty cast iron to give it a spin on my grill. While you can technically blacken with any skillet, and indoors, cast iron is the truest and best vehicle for the best char, but the super high heat required can smoke up your house and set off the smoke alarm, and the blackening seasonings can open up your sinuses for sure, so I like to blacken using my cast iron skillet outside on the grill. When you're ready to cook the catfish, preheat your grill and the pan on the highest flame. This is a good basic blackening seasoning that you can use for fish, chicken, pork, anything you want to blacken. Since I'm serving a small crawfish etouffee with the catfish, we'll start with that, but go ahead and blend together the seasonings and set them aside. As always, recipe with full measurements and instructions is located further down the page, along with a printable you can bring to your kitchen. Prepare the etouffee first by melting the 1/2 stick of unsalted butter in a large skillet over medium heat and stir in the flour; cook and stir for about 4 minutes or until caramel colored. Add the onion, bell pepper and celery; cook another 3-4 minutes or until tender, add the garlic and cook another minute. Slowly stir in the stock or broth until fully incorporated. I had a carton of Kitchen Bouquet vegetable stock in the fridge I needed to use up so that's what I used here. Isn't it beautiful and rich? Add the pepper and Cajun/Creole seasoning. Bring mixture to a boil; reduce heat to a medium low simmer, cover and simmer for 15 minutes, stirring occasionally. Add the crawfish tails, cook and stir until crawfish is heated through. Since I'm using this as a sauce, I'm only using about 1/4 pound of crawfish, which makes it a little more economical. When we have a crawfish boil or pick some up already boiled, I always peel and set aside some to freeze. Stir in the parsley and green onion, reserving a bit for garnish. Hold over very low simmer. After the grill and pan are preheated, brush catfish fillets with melted butter on both sides and dredge with the blackening seasonings, pressing the seasoning deep into the fillets. Reserve remaining butter. Place fillets presentation side down and drizzle melted butter on top. Cook fillets about 4 minutes or until charred on the bottom. With spatula, carefully turn fish. Pour more butter over the top and cook about 4 minutes longer or until fish flakes easily when tested with a fork. Actual cooking time will depend on the size and thickness of the fillets you are using as well as the consistency of the heat on your skillet. I served mine over a bed of rice pilaf, which is easily made ahead. Add a nice mixed garden salad or green veggies on the side and you're good to go! Combine all of the blackening seasonings; set aside. Prepare the etouffee first by melting 1/2 stick of butter in a large skillet over medium heat and stir in the flour; cook and stir for about 4 minutes or until caramel colored. Add the onion, bell pepper and celery; cook another 3-4 minutes or until tender, add the garlic and cook another minute. Slowly stir in the stock or broth until fully incorporated. Add the pepper and Cajun seasoning. Bring mixture to a boil; reduce heat to a medium low simmer, cover and simmer for 15 minutes, stirring occasionally. Add the crawfish tails, cook and stir until crawfish is heated through; stir in the parsley and green onion, reserving a bit for garnish. Hold over a very low simmer. Meanwhile, preheat grill and cast iron skillet over the highest setting, until skillet appears ashy, about 10 minutes. 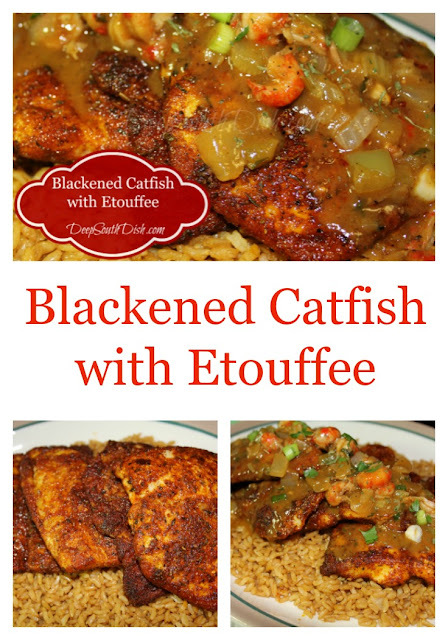 Brush catfish fillets with melted butter on both sides and coat with blackening seasoning, pressing seasoning into fish. Place 2 fillets at a time into hot skillet, presentation side down, and cover top of fillet with melted butter. Close grill and allow to cook for about 4 minutes, or until charred on the underside. With a wide fish spatula, carefully turn fish, and top with additional melted butter, cooking another 4 minutes longer, or until fish is cooked through and flakes easily when tested with a fork. Repeat with all remaining fish fillets. Actual cooking time will depend on the size and thickness of the fillets you are using as well as the consistency of the heat on your skillet. Serve immediately, topping individual servings with the etouffee, and with a garden salad or green vegetable on the side. Pour any remaining butter into ramekins and offer at the table. Cook's Notes: May also prepare stovetop with good ventilation, however, do not cover the skillet during the cooking process. I served this over my Cajun Rice Pilaf. If you don't have access to fresh or frozen crawfish, the etouffee sauce can stand on its own. 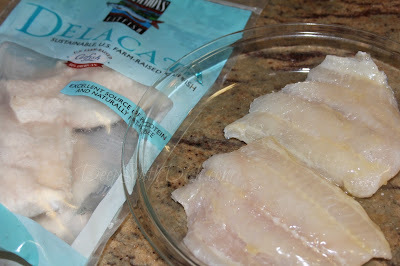 Disclosure: This is not a sponsored post, however, I did receive free Delacata product from Simmons Catfish to try. Original recipe and any opinions stated herein are honest and are my own. Mary - I'm a big fan! I'm been using your recipes to feed my family for a number of years now! I really appreciate all the little details and pictures in your recipes! it helps so much. I got a question ... Where do get this crawfish from? I live on the West Coast can it be shipped out here? Any ideas? Thank you so much!! Louisiana crawfish are available everywhere down here in the form of frozen tail meat. I purchase those when they are on sale during crawfish season and stock up, plus if we buy them boiled hot I peel and save some tails. You can purchase them online at various sources - just look for frozen tails. Now, that said, you can make the etouffee sauce and just top it with that instead. This looks spectacular Mary. 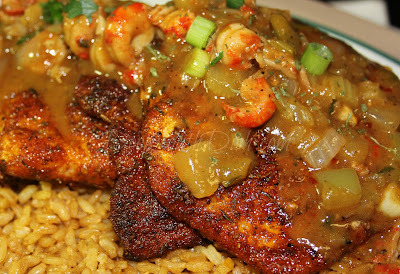 We're having blackened grouper in the next few days and I wish I had some crawfish laying around. I can't believe how delicious that looks!! Mary, I looked on their site. I know you said that delacata is like the filet mignon of catfish, which sounds fantastic! But, how much does it differ from the less expensive fillets they sell at their site? The Delacata is a center cut piece (think like center cut pork chops versus loin chops), so it's much thicker and has a meatier texture more like snapper, grouper and halibut, than regular catfish. It's also hand-trimmed which means a clean, more pure cut, less fat. It's like looking at prime rib versus sirloin in steaks - both good but one better in terms of grade. Hope that helps!